We had a sustained presence, at least one person in the search area, between February 28th and March 16th (one rain day excepted). Between the 28th and the 16th, there were no possible encounters with Ivory-billed Woodpeckers either visual or auditory. We found a modest quantity of recent bark scaling and a few fresh cavities. We were able to do some preliminary surveys of nearby areas where local people have reported seeing ivorybills; we visited one of these on foot and think it is worthy of additional attention. We aimed a trail camera at a badly damaged hickory and have identified locations for deploying two more in the coming months. In my view, the lack of possible encounters this year supports the idea that the sounds heard and recorded last March came from Ivory-billed Woodpeckers. I’m opting not to post a day-by-day log for this trip and will instead focus on what I think were the most important observations made and insights gained from this team effort. I arrived in the area on the morning of the 7th and was able to spend the afternoon in the field. I was joined at various times by Peggy Shrum, Jay Tischendorf, Tommy Michot, Amy Warfield, Phil Vanbergen, and Geoffrey McMullan, a British birder, artist, and woodpecker enthusiast. (His drawing of Mexico’s woodpeckers is shown on p. 139 of Tim Gallagher’s Imperial Dreams). Matt Courtman arrived on March 15 and remained in the area after my departure. If he has anything significant to report it will be discussed in the next post. Erik Hendrickson’s post details his time in the search area prior to my arrival. As noted, we did not hear anything suggestive of Ivory-billed Woodpecker. We did more stopping and listening than I have in many past trips; we also tried anthropogenic double knocks and playbacks of the calls recorded last year and of Barred Owls at various times, between early morning and early afternoon. At approximately 9:00 am on Wednesday, March 14, Tommy, Geoffrey, Peggy, and I heard several odd and unfamiliar “boom” sounds following my ADKs. We agreed that these were not woodpecker. They were repetitive; Tommy estimated they came in series of 5-6. While they had a metallic, industrial quality, they did not resemble shots or the typical industrial noises that are heard in the area – from logging or distant road construction. They did not seem distant, but when we hiked to the area from which they seemed to have originated, we didn’t find anything. It’s always important to remember that correlation is not causation; while the sounds seemed to be coming in response to the ADKs, we surmised that the apparent association was coincidental. Whatever the source of the “booms”, it was a strange episode. On the 15th, Phil and I heard some distant crow calls that were a little kent-like on first impression, enough for me to turn on my recorder and capture some of them, though we suspected crow and never thought they were ivorybill. You’ll hear Phil’s reaction when it became unquestionable that these were indeed crow calls. They sound more obviously crow-like on the recording than they did to the naked ear, but I’m including them here since crows are rarely mentioned as a potential source of kent-like calls. The faint sonogram is not at all suggestive of ivorybill; only one frequency is readily discernible, at around 1300 hz. To reiterate, the events of last March (2017) were unprecedented. We have had a couple of encounters involving multiple calls over an extended period – in March 2013 (these have higher fundamental frequencies) and one in the old search area, January 2010 that also involved apparent double knocks. But neither of these lasted nearly as long or involved as many suggestive sounds. Other potential auditory encounters have been brief. Thus, it’s reasonable to infer that the source is not a common species in the area. The calls strongly resemble known Ivory-billed Woodpecker sounds (and resemble them more closely than they do any known species). In my view, none of the proposed alternatives (Blue Jay, Wild Turkey, American Crow, Red-breasted Nuthatch) are plausible. I’m hopeful that further analysis will support this perspective. I found one cavity in a pine (not photographed) that seemed right in size and shape though it was old and only about 40 feet above the ground. I have not focused on pines given the paucity of records of ivorybills using them for roosting and nesting. This is probably ill-advised. The same applies to sycamores, as Erik pointed out in his trip report. I found one intriguing and apparently recent cavity, high in a sweet gum in the area that we’ve considered to be a hot zone. Stakeouts have come up empty, and as is often the case, the cavity is too high in the tree and too subject to backlighting to merit targeting with a trail cam. This is an ongoing problem, even when the cavities are much closer to the camera, as in the “neck bird” image. I also spotted this unusual, large and rectangular cavity in a cypress. My thoughts on scaling continue to evolve. As time goes on, the category of what I think is diagnostic for ivorybill grows narrower. I’ve become more skeptical about much of the work we’ve found, especially on sweet gums. Nevertheless, I still think that certain types of scaling may be diagnostic and more generally that an abundance of bark scaling in a given area may be an indicator of ivorybill presence. Tree species and associated bark characteristics (tightness, toughness, and thickness) factor in. With very rare exceptions, I only consider hardwoods. Pine bark is easily scaled. The bark must have been removed cleanly, with little or no damage to the underlying wood (targeted digs within a scaled area excepted). It’s important to distinguish between true scaling and bark removal associated with shallow excavation; many recent searchers have not recognized the distinction (some of the work shown at the second link is true scaling and some appears not to be). Diameter of the scaled bole or limb. Bigger is better. So are boles. Size, shape, quantity, and characteristics of bark chips. Bigger and broader are better. Chips can also help in distinguishing between scaling and shallow excavations. Sapwood chips point to the latter. Extent and appearance of the scaling. Neat edges are one factor. Pileated Woodpeckers often remove thick bark in layers, and their scaling has a messy appearance. Similarity to images of known or presumed ivorybill foraging sign (as in the example below), though these are few and hard to decipher, is another consideration; large, contiguous areas stripped of bark are required. I found most of the interesting scaling on the first couple of days in the field. When I arrived in the late morning, on March 7, I went to the area where the calls were recorded last March and where we’ve had the most indications of ivorybill presence in recent years. While we often find scaled pines in the uplands, this is the first time I’ve found extensive hardwood scaling – on a number of small, recently fire-killed trees. Because these trees are so small, the bark, while tight, is very thin and therefore easily removed. The scaling is extensive, but I don’t think Pileated Woodpecker can be ruled out. Some of the chips were substantial. The scaled trees are shown below. Two are black cherries, but I couldn’t identify the others. The trees were within approximately 100 yards of each other and no more than two hundred yards from the edge of the lower-lying hardwood habitat. Water levels were high; I was hoping to reach one of our trail cameras, but conditions made it impractical to do so (avoiding flooded areas would have involved at least a two hour detour). 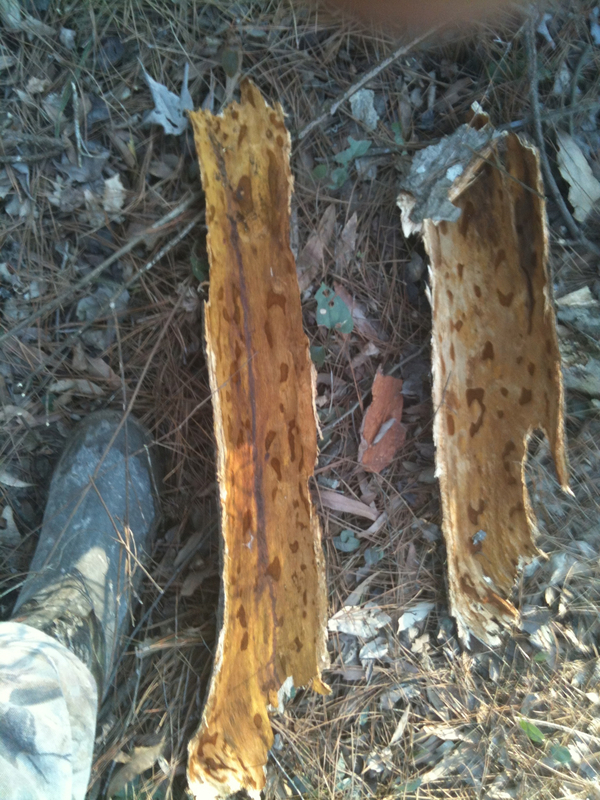 I did find some recent sweet gum scaling in the area, including on a freshly dead snag that we’d found in December. Although some of the chips were large, I don’t feel confident ruling out Pileated Woodpecker for much or all of this work. On March 8, Peggy, Geoffrey, Jay, Tommy and I visited the southern area, and Peggy spotted a sweet gum that Erik had photographed during his visit. There was new scaling, apparently done within the last week or so, especially on one of the larger limbs. The bark on this hickory is approximately .5″ thick, and it remains very hard and tightly adhering. This is the first time I’ve found a hickory that appears to have been visited and extensively scaled at least twice, many months or even over a year apart. This was a surprise, as I’ve suspected that the life cycle of the beetles infesting the snag meant that this kind of feeding was a ‘one shot deal’. That does not appear to be the case with this tree, so some rethinking may be required. Figuring out what animal is the first to scale these hickories is my top priority. We currently have three cameras deployed on hickories that are damaged, including one adjacent to this snag. I hope to be able to deploy two more this spring. If it turns out that Pileated Woodpeckers are responsible for the initial work, I will be persuaded there’s no way to distinguish between PIWO and IBWO work, although abundance and bark chip characteristics might still remain as possible indicators. I remain convinced that the ivorybill has persisted and has been present in our search area, at least sporadically, but I will be disheartened if it turns out that there’s no qualitatively diagnostic feeding sign. Tanner relied heavily on feeding sign during his surveys (though he accepted reports from South Carolina where little or no sign was found) and rejected the 1970s Big Thicket reports in large part due to the absence of bark scaling. If Pileateds are doing the initial scaling on these hickories, then Pileateds could be the source of virtually all scaling found in any part of the ivorybill’s historic range, including on live or freshly dead trees of any species. If this proves to be true, then the presence of feeding sign will be a weaker and more subjective indicator of presence. But on a more upbeat note, we also found some scaling on a cherrybark oak. Because I’ve come to suspect that PIWOs can scale sweet gums extensively and well, other tree species are of particular interest. Though the tree was alive, the limb from which these chips were stripped was not recently dead (photographing it was impractical), with no twigs or small branches remaining. Nevertheless, the chips were large, hard, and dense. I haven’t found chips like these since 2013, and I think they are intriguing. On March 12, we found one more scaled sweet gum that piqued my interest. The jagged appearance and extent of scaling on the bole are suggestive of known ivorybill work, subject to the caveats provided above. There was also extensive older work higher on the trunk. Jagged scaling on 1935 Singer Tract Nest Tree. Courtesy of the Rare and Manuscript Division, Cornell University Library. We were rained out on Sunday, March 11 and took the opportunity to drive around in an area from which there have been several local reports (though I have not spoken to the people involved face-to-face and do not know them personally). Some of the upland areas are impressively restored stands of maturing longleaf pine; we did not find any stands of large hardwoods, though we did find places with numerous beaver-killed trees. I did not take any photographs. On the morning of the 12th, I stopped to meet Jay for breakfast at one of the local hangouts, and an older man I’d talked to the year before pulled me aside and asked if I’d visited the area he’d told me about then. He specifically mentioned ivorybills and was very insistent that he’d seen them there from time to time during his hunting days (he’d stopped about a decade ago.) Last year, he’d recognized an ivorybill image on my phone but had not named the species. None of the other men in the restaurant were familiar with ivorybills, but this individual clearly knew what he was talking about. A few years earlier, another person (a preacher and barbecue chef) told me he’d seen ivorybills in the same bottom (stating that he’d thought the ‘ones with white on the back were the males and the all black ones were the females’. Peggy, Tommy, Jay, and I visited part of the bottom both men had identified and were impressed by the habitat, which is very similar to the primary search area. Like the main area, it appears to have been high-graded or selectively cut, so the conditions within a very narrow corridor (and one we believe to be fairly long) are near old-growth. We did not find any bark scaling during our brief visit to the area, but it definitely merits more attention. I suspect we were several miles southwest of the claimed sightings, so this may be an extensive, if narrow, strip of high quality habitat. The oak shown below (with Tommy for scale) was measured to be over 5′ in diameter, and many of the sweet gums in the area were well over 3′ DBH. The woods were beautiful as spring was breaking out. Conditions changed dramatically over the course of my stay. Despite some very cold mornings (we only saw one snake), leaf out progressed rapidly. On my last day in the field, Matt and I found a loblolly pine that may be a contender for state champion; the current one is just under 5′ in diameter. I suspect the one shown below is close to that and may be taller. By the middle of the trip, wild azaleas were in bloom. And finding Red-headed Woodpecker feathers always causes my heart to skip a beat. I have one or two more trips planned this season and am hopeful that they will generate some new insights. If you’re interested in possible double knocks, I’ve made what may be some important new finds, so be sure to read the whole post and listen to the clips at the end. In the meantime, I think this post will be of interest to many readers – from the new ones who’ve found the blog either because of the recent sighting or after reading about Project Coyote on the LABird list (thanks to Jay Huner for the mention) to other ivorybill searchers and aficionados to those who have had trouble hearing the putative ivorybill calls on the March recordings or didn’t want to wade through all the audio. In the easy listening department, Steve Pagans has made a compilation of the clearest calls on Matt Courtman’s first, 2 hour clip recorded on the morning of March 15 using NCH software. I tweaked Steve’s version a bit, amplifying it and applying noise reduction using Audacity, an equivalent program. Sonograms were generated using Sonic Visualizer, to my knowledge the best free program of its kind. Both Steve’s version and mine (immediately below Steve’s) should make it considerably easier to hear many of the calls recorded that morning. Steve’s is somewhat cleaner, and mine is somewhat louder. The calls have a very consistent sonogram pattern (the stacks of three or more parallel horizontal lines), with an emphasis on the second partial (third horizontal line from the bottom). There are apparent tree squeaks in both clips that have a similar quality; the dominant frequency is similar, but the tree squeaks show more energy at that frequency. The second screen cap is a detail of the first, showing both calls and tree squeaks. The latter show a brighter orange, indicating more energy at a similar frequency to the calls’ dominant partial. The sounds are definitely different, but they can be hard to distinguish at the margins. Steve’s effort, which took many hours, inspired me to revisit the recordings and specifically to reexamine possible responses to Matt’s anthropogenic double knocks and Phil’s playbacks over the course of the more than three hours when Matt’s recorder was running. I had concluded that the ADKs did not seem to have had an impact, but on careful re-listening, I’ve amended that view. Matt’s knocks do seem to have stirred up calls in reaction and to have generated several possible single or double knocks. Listening through the recordings and especially to the ADKs and their immediate aftermath was a time-consuming and difficult process, especially because the knocks are very loud and tightly spaced. Matt used two wooden blocks (rather than dowels and a tree trunk or a knock box) and did not follow a specific protocol. Overall, his approach was more aggressive than Frank’s or mine, both in terms of volume and number of knocks, and a somewhat more restrained approach is probably advisable in the future. Nevertheless, if you assume (as I do) that ivorybills were present on this morning, these recordings may provide some insights into the efficacy (or lack thereof) of ADKs in generating responses. This return visit to the recordings also supported my view that the putative ivorybill calls (recorded in the old search area) that Phil played back generated no reaction at all from the suspected ivorybills on the morning of the 15th. Blue Jays, however, appeared to respond, and I now tend to think those calls (though not all of those recorded in the old area) were Blue Jay, based on the apparent Blue Jay responses and on the harmonics. In retrospect, it’s unfortunate (but totally understandable under the circumstances) that playback of the Singer Tract recordings and other possible attraction methods weren’t tried. Perhaps another opportunity will present itself, although the events of March 15 were singular . . . thus far. In the first of these two clips, the playback seems to have provoked Blue Jays to call faintly. In the second, in which the Blue Jay calls are easier to hear, they had been calling before the playback began. Sonogram of played back calls showing fundamental frequency, strong second partial, and strong higher harmonic at approximately 5000 hz. Presumed Blue Jay call is the faint horizontal line at bottom center with a frequency of around 2000 hz. By my count, Matt did 7 sets of ADKS and performed approximately 205 knocks in all. I noted six possible double or single knock responses (of varying quality) in four of the six series. These knocks occurred within seconds of ADKs. The temporal proximity between the ADKs and the possible DKs and SK in response make it less likely that Matt and Phil (to a lesser extent) would have noted them in the field. I’m posting the relevant extracts below in unmodified form followed by clips with the interesting knocks amplified using Audacity. They should be audible through a desktop computer, but headphones will help. To repeat a strong caveat: Matt’s ADKs are very loud (which made this analysis especially difficult). I should also reiterate that I don’t consider myself particularly skilled at analyzing recorded knocks; I don’t have the greatest ear for intervals and have no direct field experience with Campephilus woodpeckers; my ability to interpret sonograms is also limited. Nevertheless, I’m sure these sounds are neither shots nor industrial noise (or duck wingbeats). With one exception (the fifth knock, which sounds like a single to me), I’m also confident that Matt was not the source of the sounds. Some of inadvertent bumping together of his blocks should be audible at various points, and it has a different quality. The first set of ADKs was the shortest, involving only six, and these were very closely spaced. The first ADK in the series produced a possible DK in response. Matt began the series 15 minutes and 52 seconds into the recording, and there had been a kent call at 14:59. Both a possible DK and a kent call can be heard between the first and second knocks. An additional kent can be heard after the third knock (omitted here). I did not find any possible double knocks in the second and third series, and there were only a few kent calls – one during the second and three during the third. There was a possible double knock in the fourth series, at 1:48.22, two seconds after an ADK. During the 5th set, on the second clip, I found a possible single knock at 3:16. (Steve Pagans, who has an excellent ear, thinks it’s a closely spaced double.) I can’t rule Matt out completely as the source of this sound, but I think that’s a remote possibility. Edited to Add: Playing the clip at a slower speed, reveals that there are two distinct knocks, the first louder, and leaves me convinced that Matt was not the source of this sound. Also on the second clip in the 6th set, there’s a possible double knock at 30:26, approximately 2 seconds after an ADK. On the final recording, during the 7th and final set, there’s possible DK after the 5th ADK in the series. It was preceded by a possible ambient DK about 50 seconds before Matt began the ADKs. The ambient knock is slightly buried behind some rustling, approximately three seconds into the recordings. To my ears, the DK in response sounds as though the first knock is softer than the second, something that’s uncommon but not unheard of for Campephilus woodpeckers. I’ve included both the entire relevant sequence and extracts in which I’ve amplified the knocks. Finally, in listening to parts of Matt’s first clip again, I noted that there are a number of very distant kents. These are barely audible at normal volume and only faintly so on the amplified version. This suggests a highly mobile source (or sources) for the calls. It also suggests that there may be more calls on the recordings than the approximately 200 hundred I originally estimated. Steve noticed these calls too but elected not to include them in his compilation because the amount of amplification necessary degrades the sound quality. Thus, it may be difficult for some readers to hear these more distant calls. The first few seconds of the extract below are unamplified to give a sense of the volume of other ambient sounds at the time. The kent calls come toward the end, and with one partial harmonic showing up faintly on the sonogram (the lighter colored dot near the left margin in the image below). Click the hotlinks for prior posts and pages related to the March recordings. I owe readers the final installment of the “Bits and Pieces” series (hotlink is to the most recent installment). I anticipate that it will be my final post for this eventful year. Look for it just before Christmas. We have only visited the southeastern quadrant of our “northern sector” four times. This is mainly due to the amount of time it takes to cross about a mile and-a-half of the uplands surrounding the bottom. Bob and I decided we would try a longer, but possibly quicker and easier, approach by following a fire lane that is maintained a couple of times a year. It was a pleasant, if boring, hike of about a mile and three quarters, a little further, but much easier going to get to the edge of the bottom. The forest on this side of the stream is of a somewhat different composition than that on the other side. As well as the sweetgums, loblolly pine, and various Quercus sp. an appreciable percentage of the trees are mature 3′ DBH or more beeches. We made our way to the main channel with relative ease – this quadrant of the forest seems not to have as many deeply incised sloughs and secondary channels, so the temptation to just keep moving slowly is irresistible. After reaching the main stream, we began to do half-circle transects, looking for anything interesting. We finally took a break about mid-morning, and I performed an ADK series and shortly thereafter a series of playbacks. We then sat quietly for about thirty minutes. We were separated by about 15 yards, and Bob was sitting at the bottom of a large tree facing away from me. Before we continued on our way, we compared notes, and we had both heard two double knocks, and possibly one kent call. Kent calls, what are and what aren’t, have been debated ad nauseum for years. Suffice it to say that this one, though further away and not as loud, stood out from the Jays that were making a ruckus all around us. All we could say for sure is this one was “different” in a way that’s hard to describe. We continued on, finding our way back to the bank of the main channel every so often. The stream is dryer than I’ve ever seen it. At one point, I came upon a series of curves, which being a bit deeper, allowed the water to pond. It was not running and none too fresh, but it was water. I noticed these two turtles on a log, probably a slider of some kind and a cooter. They seemed to be annoyed at one another. We continued easing through the forest, moving slowly and stopping to listen and look occasionally. I photographed Bob standing next to a large swamp chestnut oak. At about one o’clock, we’d just kept walking through “lunch hour”, we decided to take a break. While we were snacking and rehydrating, I performed another series of ADKs followed by playbacks. After about an hour, Bob and I once again compared notes, and once again we had heard a pair of kents, and a single DK. I have to note that nothing we heard appeared to be a direct response to the recorded kents of the anthropogenic double knocks. While I was sitting there, I made this picture of a Red-headed Woodpecker. We finally came to a corner with an adjoining piece of private property. As the property line was on a direct bearing for the truck, and was “only” a mile through unexplored terrain, we decided to take a chance even though terrain sometimes imposes obstacles. Fortunately for us (we had covered about six total miles previously) the terrain wasn’t bad at all, and other than a couple of hills to climb, the walk was pretty easy. On the way home, we stopped and picked up dinner at a local BBQ joint that has become something of a Project Coyote tradition. We arrived at our entry point about ten minutes after first light and headed into the forest. This particular area Mark has discussed a number of times – a couple of hundred yards from the parking area one encounters a tornado blow-down track that is approximately 400 yards wide. This area is unbelievably difficult to traverse – large boled trees scattered like a giant’s game of pick up sticks, thick, almost impenetrable thickets of new growth, blackberry vines and saw briars, as well as the usual random sloughs, and cutoff stream channels. It took us nearly an hour to make the half-mile to the location of the snag where photos, discussed in previous posts by Mark, were taken. My express purpose was to place one of our new Plotwatcher Pro cameras in this location. New growth of limbs and underbrush made this deployment a bit more complex than the last time. Bob trimmed intervening vegetation while I programmed, set up and started the camera. After all this work, I used the camera’s Aimcheck function to make sure that the cam was placed optimally. We then proceeded to follow the bank of the main channel downstream. It should be noted that the stream is not running. In all my years of coming to this area, as a hunter, and searching for ivorybills, I have never seen it this dry. We came to a familiar ponded slough where Mark and I have often stopped and rested for a few minutes. One of the larger trees, a 3.5 ft. DBH water oak had blown down since the last time Mark and I had visited the area in April. The tree still had leaves on it, though they were dry and brown, and the bole and upper branches had no sign of woodpecker workings. I believe that this tree was blown down on or around July 4th as that was the last time severe weather passed through the area. As they are very light and easy to carry, I had an extra Plotwatcher Pro cam with me. Taking advantage of this opportunity, I deployed the camera with a good view of the bole and top – hopefully this tree will attract insects, and soon thereafter woodpeckers feeding on them. Frank Wiley examining a cavity through binoculars next to downed water oak at new camera deployment location. Bob and I continued upstream for another half mile, located a nice spot with a good view, and I performed an ADK series, followed about ten minutes later by a series of electronic playbacks of Singer Tract ivorybill calls. Shortly thereafter, Bob heard a double rap drum, that was captured on my digital recorder. I personally don’t believe that the drum was a direct response to my ADKs as there was at least a fifteen minute interval after the last of the ADK/playback series. The double rap is not “perfect” in that the “intra-knock interval” is about .05 seconds longer than the “ideal” – based on averages of the intervals of other Campephilus drums – but it sounds very good. As we were leaving, I determined to blaze a better trail through the blowdown area. Following a straight bearing on my GPS, I used a hatchet and snips to carve a path through the heavier ground cover. Perhaps crossing will be a bit easier next time. On the way out of the forest Bob and I were treated to one last encounter. We came across this Buttermilk Racer sunning itself on the road. While not endangered, this snake is uncommon and seldom seen. After taking a few photos of him, I tapped his tail with my foot, encouraging him to seek a safer place out of the roadway. I really enjoyed Bob Ford’s visit – he is a skilled woodsman and birder, and his insights as a professional wildlife scientist are greatly appreciated. I am looking forward to Mark’s next trip – hopefully over the Thanksgiving holiday. Also, Mark and I would like to thank The Rapides Wildlife Association, and another donor “MC”, for their much appreciated and unsolicited assistance in purchasing our new trail cams, memory cards, and batteries. A note from Mark: Frank captured some of the possible kent calls on his recorder. They are faint, and it may not be possible to tease any detail out of them. He may do a follow-up post if anything of interest can be gleaned. Since summer is here, and things are slow, I’ve reconsidered my decision not to post audio obtained in the course of our searches (although I’m not sure I’ll repost old audio from the original search area.) We did not record anything of note during 2013-2014, although we did have a number of auditory encounters. It’s not feasible to keep a recorder running at all times, so when interesting ambient sounds occur, it’s only possible to capture them when they go on for an extended period. In these situations, it’s a judgment call as to whether to approach the source of the sounds, try to record them, or a mix of the two. These recordings were made on March 2, 2013, and I have included my notes to provide details and context (location redacted.) On the morning clip, the calls can be heard at approximately 0:03, 0:17, 2:04, 3:36, and 3:47 (two calls in very close succession with the interval almost indiscernible to the ear but evident in the sonogram). On the afternoon clip, the only call captured is at approximately 0:52. On the morning clip, there are toots on a clarinet mouthpiece at approximately 0:25 and 1:30, so beware if you’re listening on headphones. The first clip can be played directly from this page. Click on the link to play the second in its own window. I can only hear the call on the second clip with headphones. Although the duration of the calls appears to be consistent with the Singer Tract recordings, the base frequency is considerably higher, approximately 920 hz. John Henry and I were ***** on Saturday March 2, 2013. Conditions were mostly cloudy and cold. * Winds were strong (gusts probably around 20 MPH and not many birds were calling). The morning had been active, but as winds picked up, birds went quiet. At approximately 10:15 am, several crows were calling loudly, but I heard 2 intriguing calls behind the crows. I asked John to stop and be quiet. The calls continued, sporadically, for the next 30-45 minutes. I was able to record some of them. We both estimate the distance at around 200 yards and agree that two birds were involved. We both agreed that the calls were mobile and over the course of the sequence, they came from at least three directions. We tried to follow the calls but did not see anything. Most calls were singles, but in a couple of instances, a first call was followed by a second one within a couple of seconds. The pitch of the second call seemed lower. The duration of the calls seemed to be short. They lacked the intensity of the Singer Tract recordings, but were clearly not Blue Jays, nuthatches, or tree squeaks. I blew on a clarinet mouthpiece. The calls continued, but neither of us had the impression that there was a response. Between us, we heard a minimum of 18 Ivory-billed Woodpecker-like calls in the morning. We left the area and returned late in the afternoon. At approximately 5 pm, we were at the spot where we found the bark chips. At this time we heard approximately a dozen more of the same calls and were able to record a couple. The first call I heard seemed a little off, as the note seemed to be doubled, one in immediate succession after the other. ** This only happened with the first one. The others were virtually identical to those heard earlier in the day. A white-breasted nuthatch called during this sequence, and there was no possibility of confusion. *The two nearest weather stations reported lows of 27 and 30 and highs of 47 and 49 respectively. Temperatures in the search area were likely slightly lower. When the morning calls were recorded, temperatures were in the mid-30s. **This was what I wrote at the end of the day, without consulting any literature. Of course doubled calls are described by Tanner and occur on the Singer Tract recordings. We are not claiming these as Ivory-billed Woodpecker calls, but several ornithologists have been unable to identify them. The sound and base frequencies are consistent with calls recorded in the old Project Coyote search area. Edited to add: Here’s a sonogram showing the two calls that came in very close succession at 3:47 on the morning recording. I was unable to tease out anything but the base frequency.